I took a spin around the garden with my camera the other morning and was delighted to find so many plants starting to move. We have had rather a good Winter and have missed all the more extreme weather events that the rest of the country has suffered. So much for our southern relatives anxiously inquiring how we are getting on when for example they have been buried under snow when we have had hardly any. All but two of the pictures were taken in the same half hour last week. I have taken the liberty of giving a few cultural notes and links to my articles about them. Its been wet. It was the same last year and my daffodils did remarkably well. 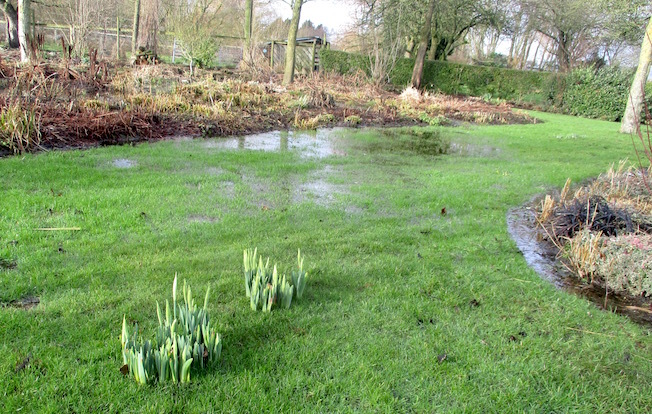 Daffodils tolerate these conditions but I am anxious for the water to go. 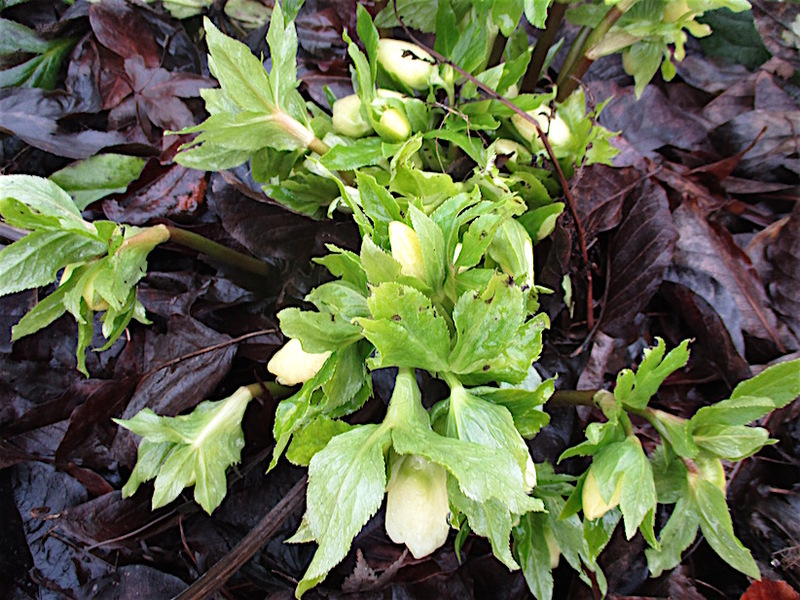 Fortunately there is no iron chlorosis sometimes temporarily induced by cold wet conditions. My theory is that the downward drainage of water is sufficiently speedy that it is still charged with dissolved oxygen. 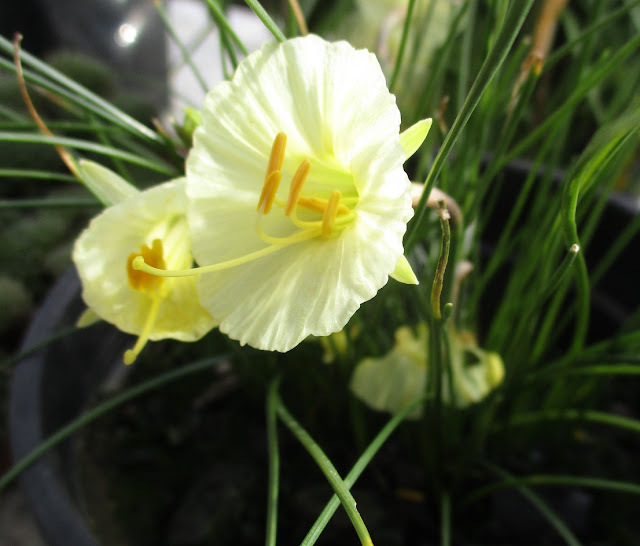 Three previous daffodil articles are linked in the blog theme column. The mild Winter has suited garrya this year and I have at last persuaded Brenda not to train it back in Summer when the buds start to form. 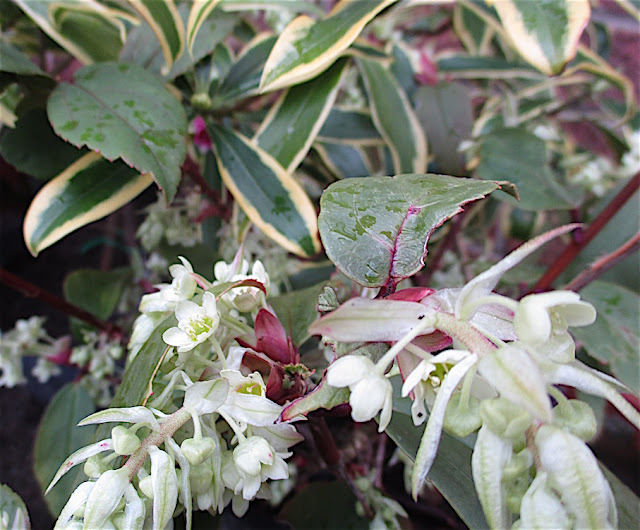 Individually the flowers are not dainty but the bunches densely covering shiny evergreen foliage look superb. 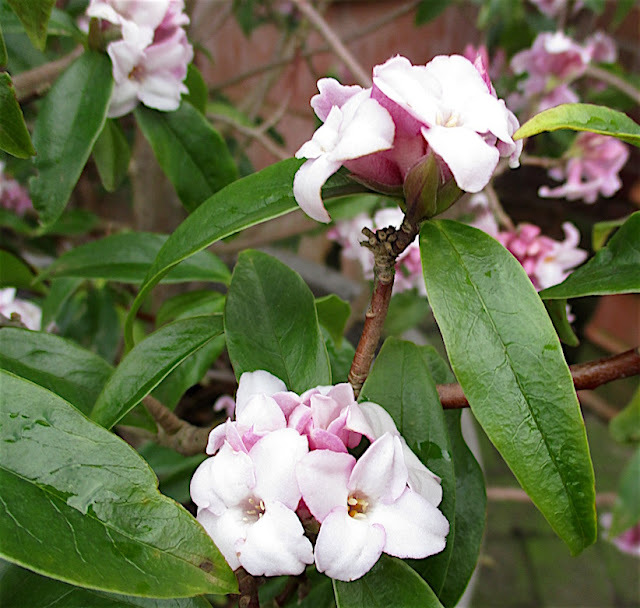 The beautiful scent is almost as strong as the Winter box and Brenda approves. Indeed it's her favourite plant and the flowers last for weeks. Every garden should have one! This is early because it has been in my unheated greenhouse. 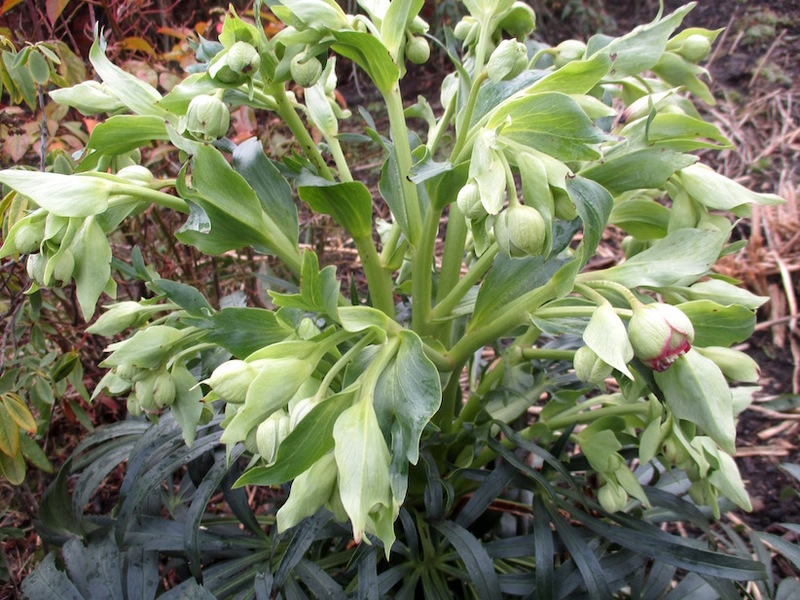 Having built up strength from feeble purchased bulbs by spending it's first Winter in my greenhouse this is no longer necessary and I have now strong clumps flowering from March in my garden. It is useful to start some early in the greenhouse to get flowers now. 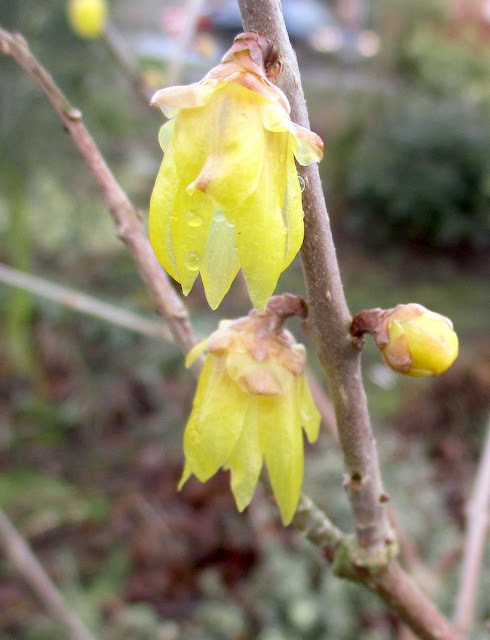 I have written about my 'iPhone plant' before. This very common plant is vaguely attached to my garage east wall and scrambles into other climbers. It's January/February flowers are a delight and are mildly scented. If I remember to prune out excessive brown wood later it is just about worth keeping. Where on earth did it come from? It's three years since Peter gave me a potful of seedlings and I have now had two seasons of flowers. 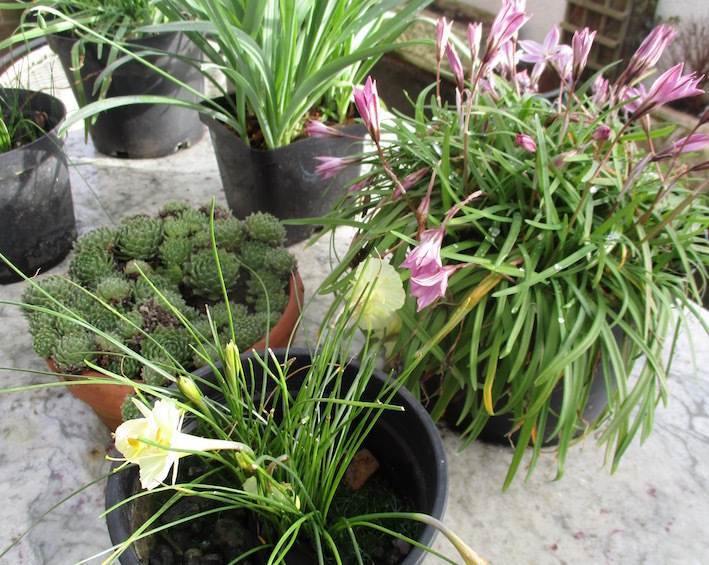 Division after flowering has increased my pots to four. I have grown it as a pot grown alpine as allegedly it must be almost bone-dry between dying down and early August and I provide these conditions in my greenhouse. Bone hardy it will survive 15 degrees centigrade of frost and is ideal for our outdoor display table. I shall try some completely outside on a dry site this year. 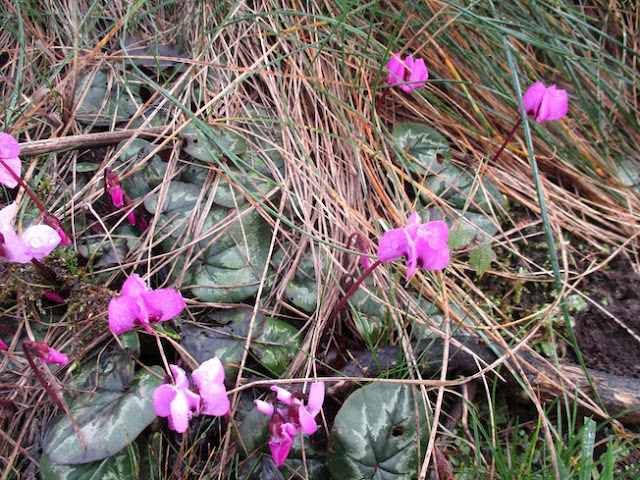 In January 2017 I split a large pot of emerging Cyclamen coum corms and planted them on Cathi's grass verge. They have done better than any elsewhere in my garden. 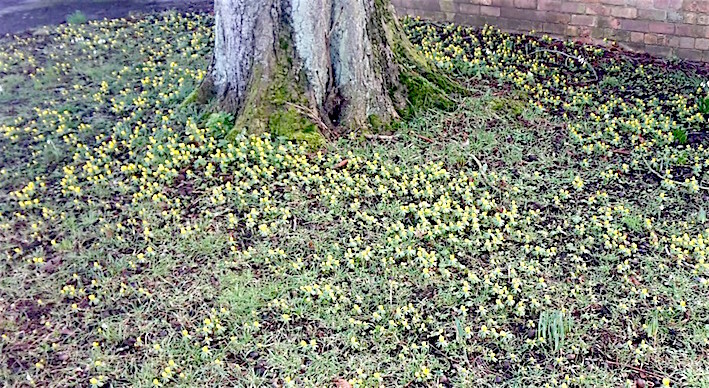 I am so pleased that although yesterday it was still raining I planted some more in a similar grassy place. 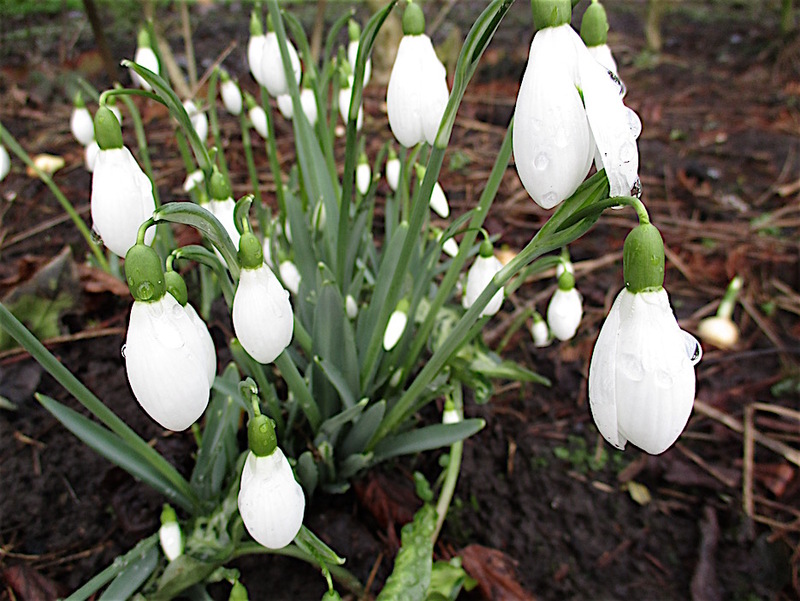 I think I have eight different snowdrops in my garden but do not know their names. This one is the biggest and I love the lantern like flowers before they fully open. It struck me that I had some very strong clumps but not enough of them. Yesterday I thrust my spade in very deeply and three have become twenty. These new clumps each of a dozen bulbs rectify the situation. All of them are beautiful, but oh! Snowdrops! Don't you just love them. The abundance of colour and shape of flowers in your garden is amazing. When I walk past people's front gardens on my way to work, I see aconites, snowdrops and, since the beginning of the week, crocus. 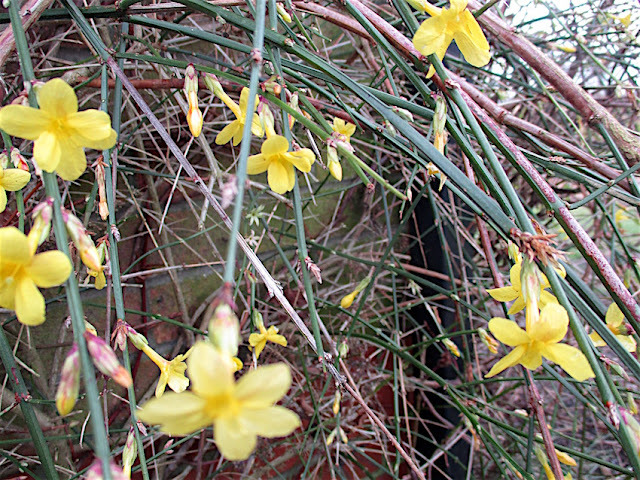 What we call winter jasmin is everywhere, and I have a hard time convincing my boyfriend that they are not forsythia. Clearly you have a lot of work to do on your boyfriend. At least forsythia and jasmine are in the same family oleaceae as is olive. 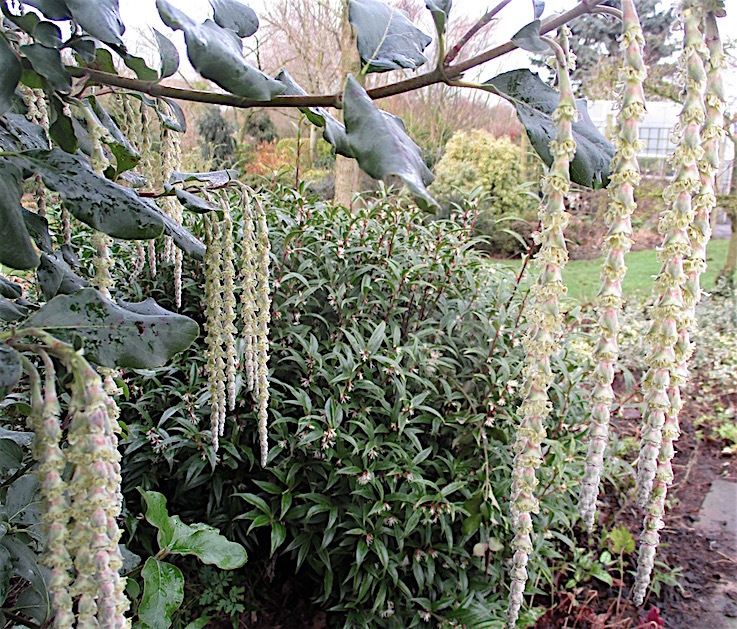 I am determined to take a gamble and find a sheltered spot for Garrya elliptica James rooof. I have narcissus envy. Do you know of a. Bulb supplier? I get all my bulbs from Parkers Wholesale. They have a good website and trade with anybody.